Not to be confused with the large circular enclosure that once crowned the nearby Hunter Hill, the nature and age of this large D-shaped earthwork has long been a source of speculation, with the majority of it centring around a Roman origin — and for good reason, it has to be said! More than 280 yards (260m) in circumference, its north-south axis measures 82 yards (75m) at the greatest and 88 yards (81m) east-west. Its main feature is a decent ditch that averages 8-10 feet across round most of the D-shaped feature, and between 2-3 feet deep. It would obviously have been deeper than this when the ditches were first dug, but it’s now very overgrown across the entire site with Juncus grasses and tribbles (tussocks). A small internal ditch runs into the enclosure from the northern side. Its function is unknown. 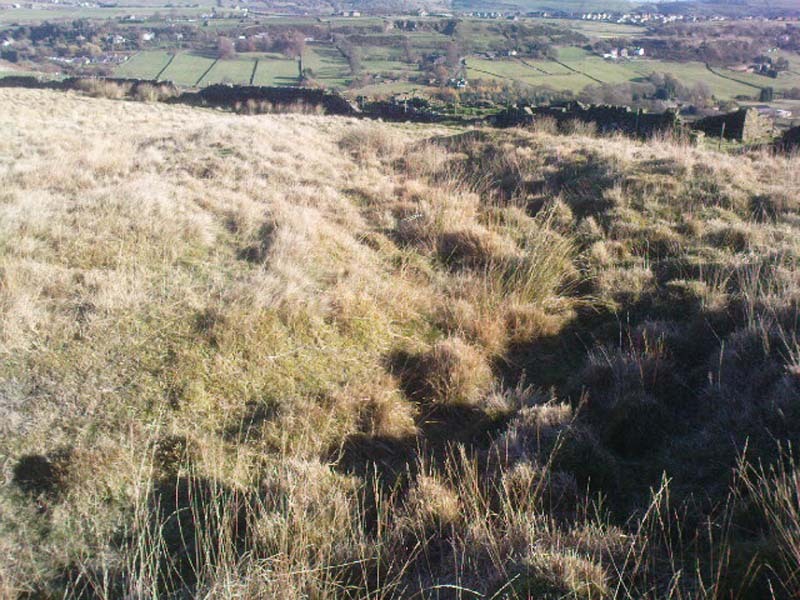 A small mound near the centre of the site has been posited by Calderdale archaeologists to be modern remains. Although the main feature is the D-shaped earthwork, other features are apparent. For example, what looks like another man-made dyke cutting into the site on the southwestern side is in fact a natural stream channel. This natural feature may have been an integral part of the enclosure when it was first built. 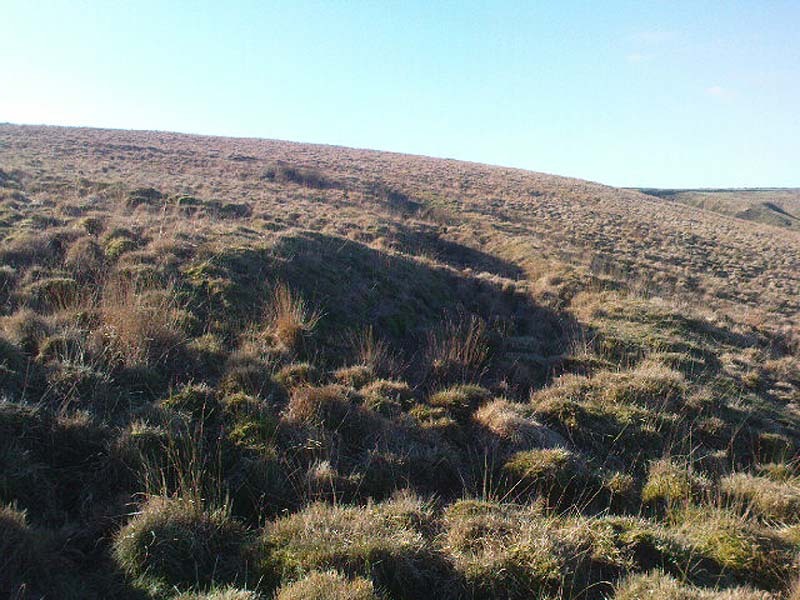 Above the northwestern edge of the ditch (as can be seen on the aerial photo) are other earthworks that run around the western edge of the main feature. This is probably what F.A. Leyland (1867) meant when he described there to be “the remains of several lines of intrenchments” here. Also coming into the southwestern side are what are thought to be the remains of a Roman Road. 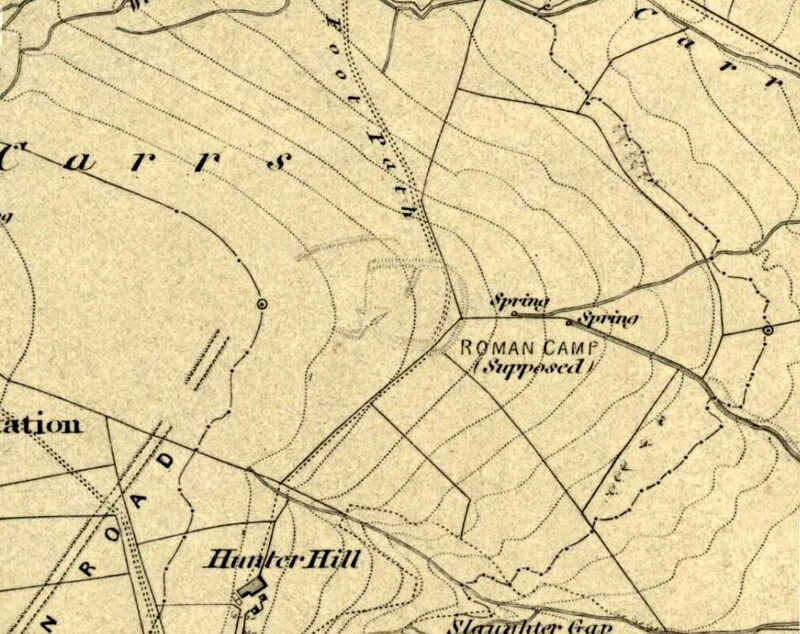 Early OS-maps (above) show the road running within yards of this enclosure — and it was this which, logically, led many earlier researchers to posit the notion that this site was in fact Roman. However, a dig here in 1951 recovered prehistoric pottery, which knocked the date back to the Iron Age. On the south and east sides, parts of the ditch and embankment have been removed by quarrying and farm-workings, with the walling on the eastern side completely ruining that part of the monument. A great number of flints have been found on the hills above here. I’m unable to give a more detailed exposition on the archaeological finds at this site as I don’t have a copy of Mr Varley’s (1997) essay that he wrote for the Transactions of the Hunter Archaeological Society, which apparently gives more info. When I manage to get a copy of the journal/essay, I’ll add the relevant data to this profile. A note must also be made of another, previously unrecognized enclosure on the same hilltop a couple of hundred yards to the west from here. 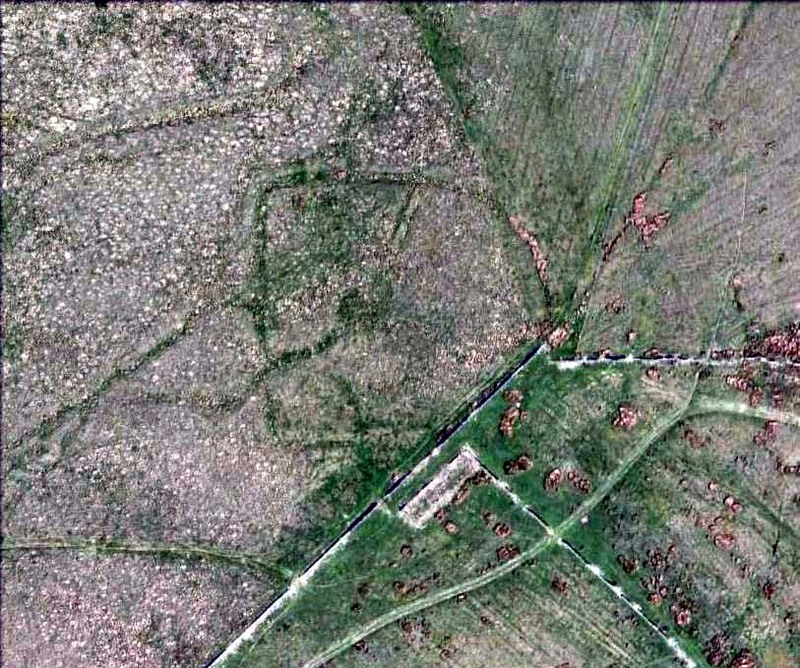 Very little trace of it is still visible at ground level, but the outline of the curvaceous quadrilateral ditch form can be seen from the air. It would appear from its form to be consistent with an Iron Age enclosure, though without further research this has to be proclaimed as hypothetical. No excavations are planned here in the near future. But Leyland deemed the armoury finds here — that appeared to substantiate the folklore — were from a much later period in history than the enclosure. 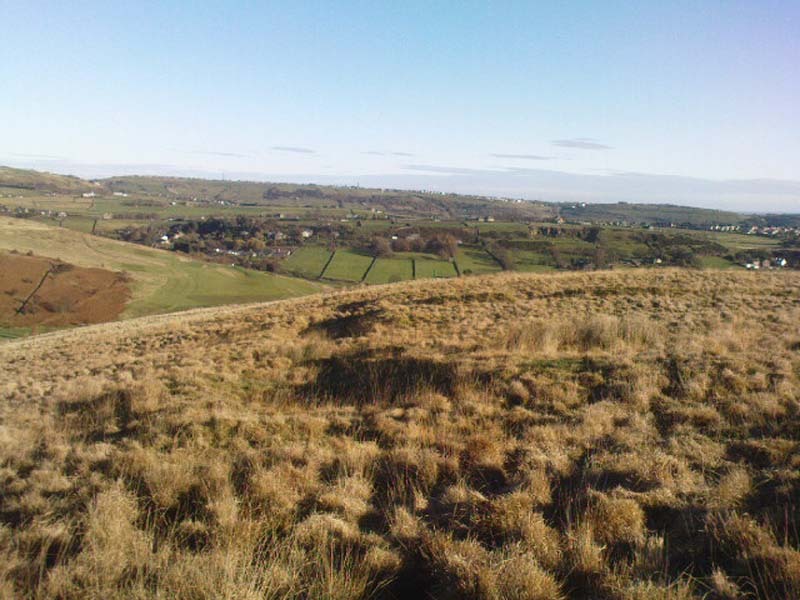 But I must draw attention to the remarkable Mixenden Finds, as they’ve become known: a collection of finely polished prehistoric axes and other stone remains a few hundred yards below The Carrs and which may relate to such folklore. This entry was posted in Brigantia (Northern England), Settlement/Enclosures, Yorkshire, West and tagged antiquarian, antiquities, Archaeology, Calderdale, ditches, dykes, earth mysteries, Earthworks, enclosure, England, english heritage, Halifax, heritage, Iron Age, Ogden, Ovenden, prehistoric sites, Romano-British, Romans, settlement, Wainstalls, West Yorkshire. Bookmark the permalink.